Ensure your loved ones get the assistance they need with elderly care services from Moore Care Assisted Living Facility in West Palm Beach, Florida. Our facility provides daily living assistance and care for seniors aged 60 and older. Contact us today to learn how we can provide a home away from home. We have new state of the art 6 bed memory care locked facility specializing in residents with Alzheimers and dementia. We also provide daycare services during the day and evening every night, we provide respite care as well. This is a home-like setting "feels as if the resident is in their own home with 24 hour care". 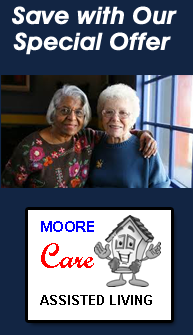 At Moore Care, we believe that the positive relationship between staff and our clients makes us an exceptional facility. Each employee is carefully screened and undergoes a thorough training process to provide outstanding service and to prepare them for their role as part of our team. Contact us today in West Palm Beach, Florida, for details about our elderly care services.